With the implementation of the B-20 mortgage stress test, Canadian Real Estate is beginning to feel a noticeable slowdown. National home sales declined by 16% in Q1, with prices also dropping by 6%. 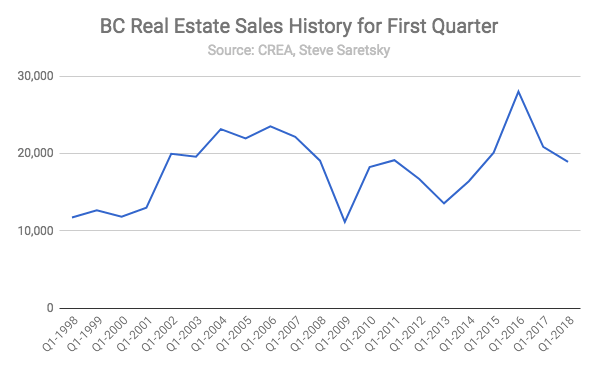 It was the first time first quarter price growth has turned negative since 2009. Yet despite the cooling across the country, the province of BC remained relatively resilient. BC managed to squeeze out positive price growth on a year over year basis. The average sales price in Q1 2018 increased by 8.49% from Q1 2017. Although this was almost entirely fuelled by the condo market, which has come under siege following a plethora of buyers being knocked down the housing ladder following B-20’s recent mortgage tightening. Declining sales and volumes also suggest BC Real Estate could face further headwinds moving forward. Total residential sales trickled in at 18,932, marking the lowest total since 2014, placing sales at pre housing boom numbers. The pullback also marked the second annual decline for first quarter sales, suggesting new lending standards are eliminating buyers at current prices. 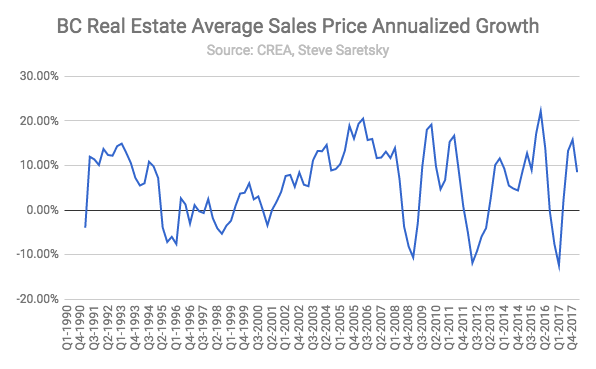 The average sales price for BC Real Estate now sits at $732,161 as of Q1 2018, with new listings virtually unchanged from a year ago.